Over two years ago, I met someone with whom I developed a strong and strange friendship. It was never a romantic thing, and probably had some resonance from past experience. I had spent a fair bit of time with this person, and did my best to do what I could to help him in a time of need. Last year our time together came to an end with arguments and hurt feelings, along with a feeling of betrayal and unanswered questions. I spent a lot of time afterwards wondering what happened, why, what if, etc., etc.. I wanted answers, and thought that if I had them, I’d feel better. Too much time spent in the story of what happened drew me down a dark path that took a while to reverse. It wasn’t until I dropped the story line and the unanswered questions, and simply recognized and accepted the feelings and held them in awareness, that the wounds healed in time. The story line eventually dropped, and I moved on. All things that are of the nature to arise are of the nature to cease. I also had the opportunity to reconnect with other healthier relationships and to be reminded of how they feel as well. I’ve been in a much more peaceful mental space for a while now. From this stable ground I recently encountered this person again. In the interest of reconciliation, I thought it might be a chance to exchange perceptions of what happened, and to be honest, hoped to receive some sort of an apology. The same dynamics that plagued the friendship in the past have continued, and I’m not terribly surprised. The pleasant surprise is that my involvement in the answers (and the person) is not there anymore. I no longer feel the need to know what happened. The clinging to “why” isn’t present, and neither my happiness nor peace are dependent upon the answers. Sharing perceptions of what happened for both of us would have been a step towards true reconciliation, and it’s a bit sad that this will not take place. There is a shallow détente now, but nothing more. I wish him well and will continue to be kind, but the true friendship and trust are no longer there. Instead I’ve reconciled myself, and I’ve moved on to a healthier place. As memories or emotions appear, I’m continuing the same process that my teachers have given me: feeling the feelings in the body, accepting them, and riding the wave with awareness as the feeling passes. The answers to what happened last year will most likely never transpire. I’m no longer counting on them. The reconciliation has happened with the feelings involved, even if it hasn’t been with the relationship in which they arose. The story line continues to fall away, and my own sense of peace has emerged from the rubble. That’s all the answer I need. Please don’t judge. For my final travel hurrah for a while, I went on a cruise. I can plead that it wasn’t my idea, but I did have a great time, regardless, and am thankful that my family members prompted me to visit such an amazing region. I went with my son, daughter in law, and her parents on a week long cruise through the inside passage of Alaska, and enjoyed it immensely. The scenery was fantastic, and being on a cruise ship wasn’t as tough as I thought it would be. Gambling, formal events and drinking alcohol are not on my lists of ‘fun things to do’, so I had imagined I’d feel quite out of place (on the ship, not with family members). But being in nature, spending time with family, and learning about new places are quite enjoyable, and that’s definitely what happened. I arrived separately in Vancouver, BC, and had time to explore the huge ship on my own before we set sail. A city in miniature; the ship had fifteen floors, several dining rooms, a gym, pools, hot tubs, a casino, a theater, and more, with a capacity to house 2600 passengers and 1100 crew members. One could get lost, and occasionally I did. Setting sail introduced a peculiar sensation of gentle rocking which took some getting used to, but with acupressure wrist bands, nothing that produced sea-sickness. We stayed at sea for that evening and the next day, and after 24 hours the bands weren’t even necessary. So I was able to enjoy the delicious food, and comfortably spend time with family on board. While drinking and gambling were the agenda for some, there were plenty of other things for us to do on board. 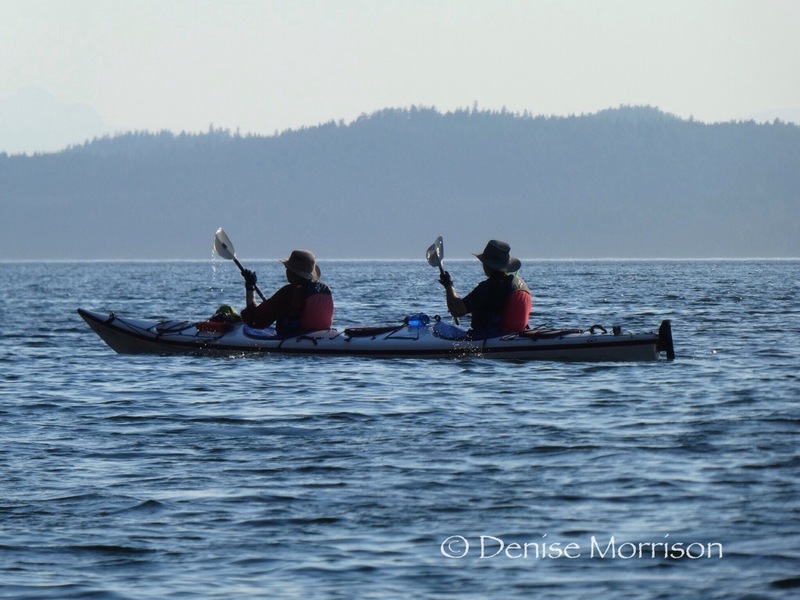 Our group attended trivia contests (winning twice) and enjoyed lectures from Libby Riddles (first woman to win the Iditarod) and Susan Marie Conrad, who kayaked solo for 1000 miles along the inside passage. 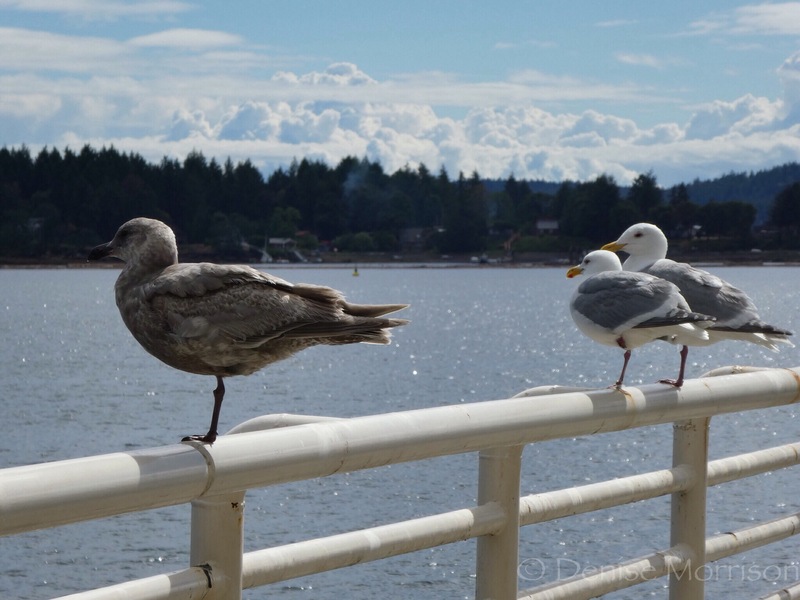 I also enjoyed walking around the promenade deck, absorbing the scenery and the salty sea air. 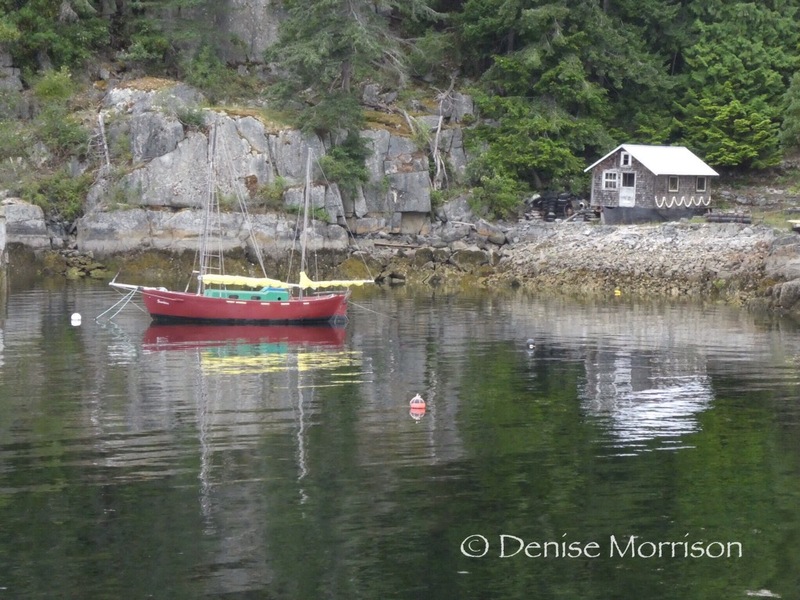 Our first port was Ketchikan. 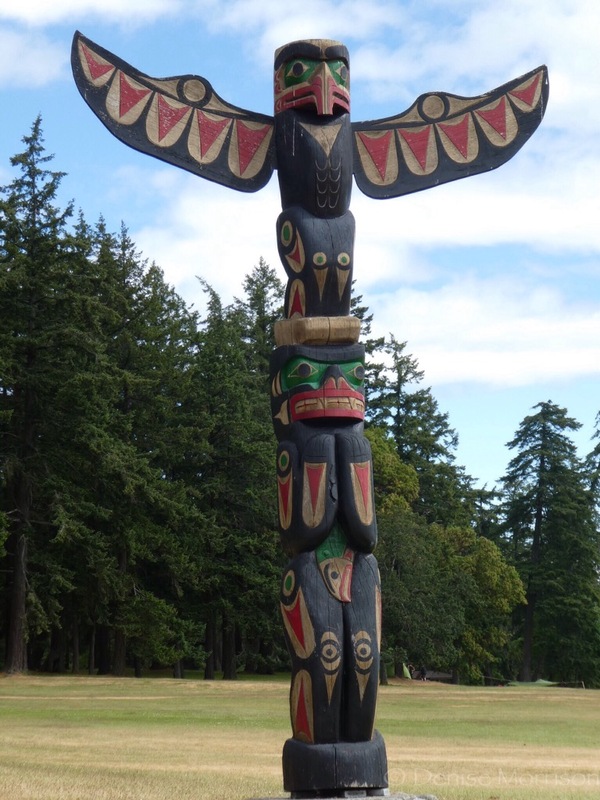 Its name, derived from Kich-xaan, comes from the first Tlingit inhabitants. It’s located on Revillagigedo Island, and is only accessible by sea or air. The climate is temperate rainforest, although we had no rain during our visit. I started out early to see a bit of the town and was not disappointed. Taking the City Walk, I traipsed through historical areas of Creek St. (formerly the location of the city brothels, now a shopper’s haven) and the harbor, and then slogged uphill to the Totem Museum to view traditional carved totem poles from the native Tlingit, Haida and Tsimshian cultures. 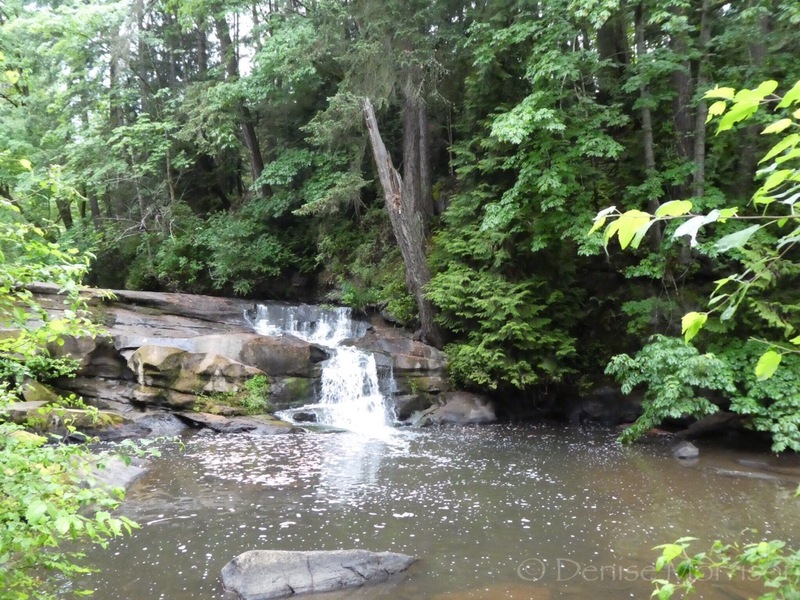 Walking back downhill I visited the peaceful city park and the salmon ladder next to waterfalls of Ketchikan Creek. Hundreds of salmon waited their turn at the bottom of the falls, summoning the energy to make successive leaps up to the top, and back to their spawning grounds. I would have loved to spend more time meandering, but we were scheduled for a kayaking trip. We boarded a bus to Clover Pass, north of the town, and were given gear and instruction, then loaded into kayaks. 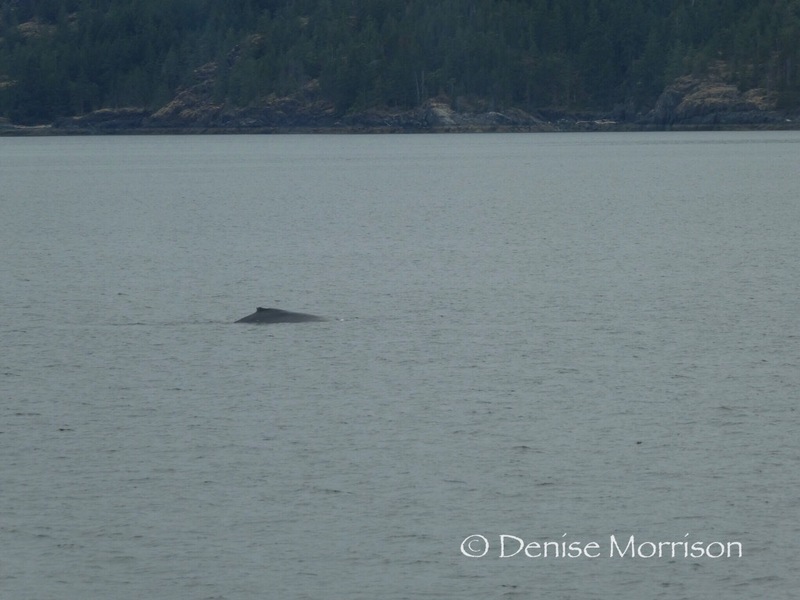 Setting off for a trip around the Eagle Islands, we saw tidal sea life, eagles, and a brief glimpse of a whale. The waters were calm, and the trip was enjoyable. 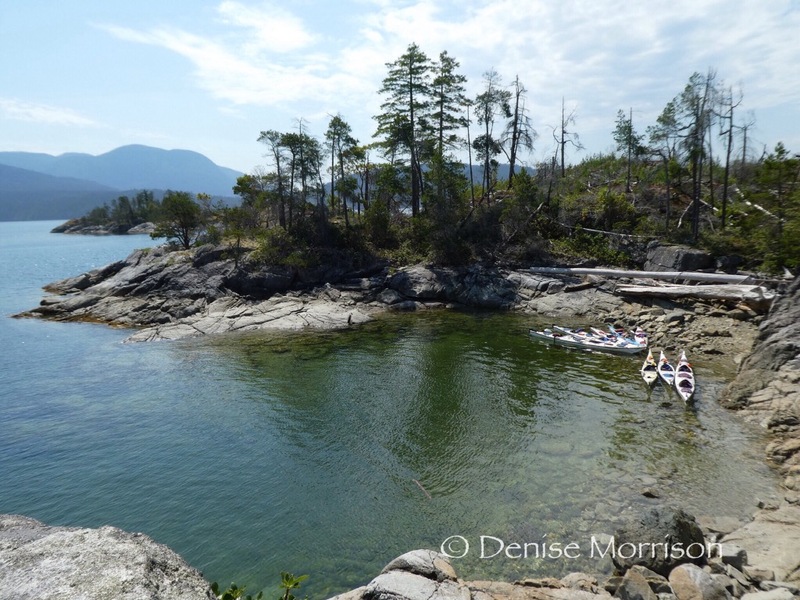 All the kayaking practice I had in Desolation Sound was rewarded: my son and I were doubled, and we often found ourselves ahead of the group. A fast stroke pace gave us time to take lots of pictures while waiting. We had just enough time to get back to the ship before departing for the next port of call, and we arrived in the state capital of Juneau the next morning. This time we started off the day with a trip to a dog mushers’ camp. These camps provide food and exercise for the dogs during off season, and a learning experience for the visitors, and a chance to snuggle with puppies as well. We learned about the life of an Iditarod racer (not easy!) and about the dogs themselves. Most visitors to Alaska think of the sled dogs as being fluffy dogs like Malamutes or Siberian Huskies. These are a different breed; leaner, and while somewhat fluffy, not as much as one expects. They love to work. The teams would howl and bark whenever they weren’t pulling the wheeled “sleds” that pulled the tourists, and we learned that they had to be trained not to wear themselves out. I had heard that the Mendenhall Glacier was a “don’t miss” experience. While there are buses happy to take tourists there for a limited time and $40, one can take the public bus for $4 round trip, be dropped off 1.5 miles from the visitor center, and take as long as one wants to walk the trails and view the glacier. There are no trails that go directly to the glacier from the visitor center, so I opted for the trail to Nugget Falls that offered spectacular views and a lovely walk. Our last port of call was Skagway, an historic town with a year-round population of under 1200 people. Judging by the amount of stores in town, its main source of income appears to be tourism. There’s the historic Red Onion Saloon and the Skagway Museum, which tell the story of Skagway’s involvement with the Gold Rush era, and then there are more shops than you can shake a stick at. We walked around for a bit, but I found nothing that I, or anyone I know truly needed. So after lunch I found the Dewey Lake Trail, and hiked to Reid Falls and around Dewey Lake through a quiet forest. Heaven. Staying on the ship, we visited Glacier National Park and College Fjord, watching glaciers calve and marveling at the scenery. Watching a glacier calve is a bittersweet experience; it’s an amazing scene to watch a mighty chunk of ice break off into the water, yet knowing that the glaciers are shrinking, it’s tough to watch that process occur before one’s very eyes. A minor annoyance were the sales pitches. To badly paraphrase Jane Austen, it is a truth universally acknowledged, that any passenger in possession of a cruise ticket must be in want of some jewelry. At least that’s how it seemed. There were several jewelry shops on board the ship, onboard announcements of jewelry sales, and presentations and advertisements of stores at ports of call. Apparently someone is buying it though, as I’m sure they wouldn’t do it if it wasn’t such a money generator for them. More serious though, are the negative effects of cruise travel. I had heard of the environmental impact that cruise ships impart onto the places they visit. After returning home, I was hoping that I could find some information that would tell me that this wasn’t as bad as I had heard. If all of these 2600 passengers took plane flights to these places, wouldn’t it be worse environmentally than being together on a ship? Sort of like a floating bus? Sadly, no. By carbon emissions alone, a cruise passenger releases roughly twice as much carbon per mile as an air passenger (Data from this article). In addition, there are other issues with wastewater release, sulfur emissions, ship noise, and bilge water as well. While many cruise lines are working to lessen the damage which their ships cause, they’ve still got a long way to go. The other issue I found was the working conditions for employees on board. Those in the service sectors are often hired from developing countries and paid less for long hours and minimal time off. While they may earn more than they would in their own country, and there is no shortage of applicants, it still appears to be a “sweat shop at sea” in many cases. I realize that it’s rather hypocritical of me to spout these statistics after I’ve gone on the cruise. I’m sorry. Would I go on another one? No, probably not. One of the things taking the cruise has done is to create a greater interest in the environment of the places I visited. I am grateful that I had an opportunity to visit this beautiful landscape, and hope to do a better job of protecting it in the future. This region is amazing, and I hope it will remain so for generations to come. 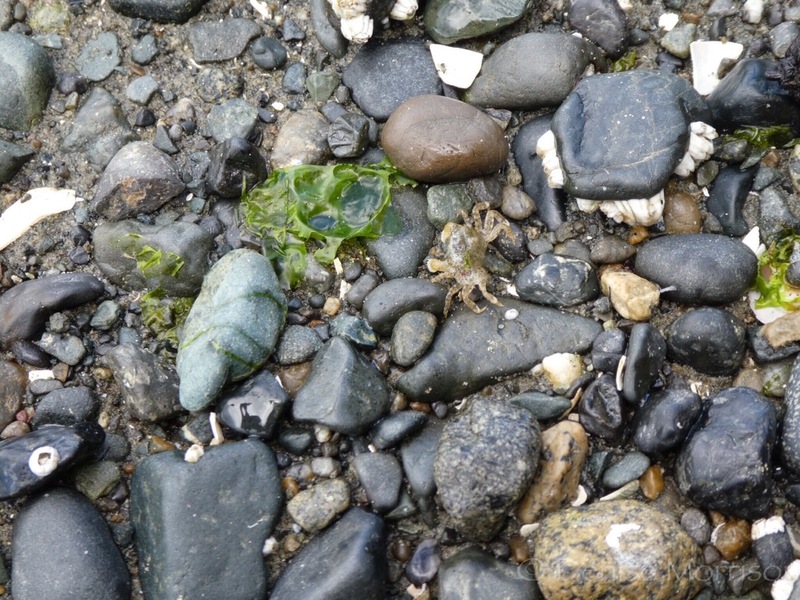 About a year ago, I was talking with a good friend of mine that had settled on Cortes Island, in British Columbia. 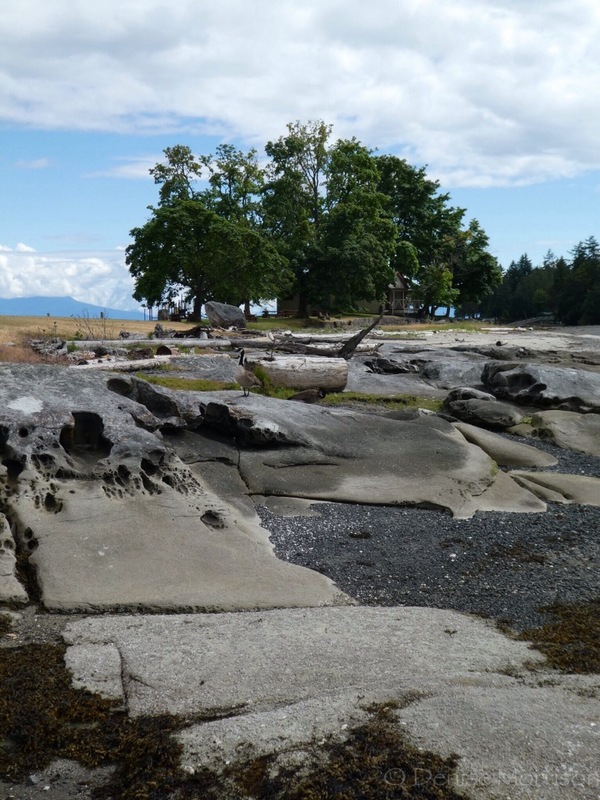 She was planning a kayaking trip in Desolation Sound with Ajahn Viradhammo, the abbot of Tisarana Buddhist Monastery. 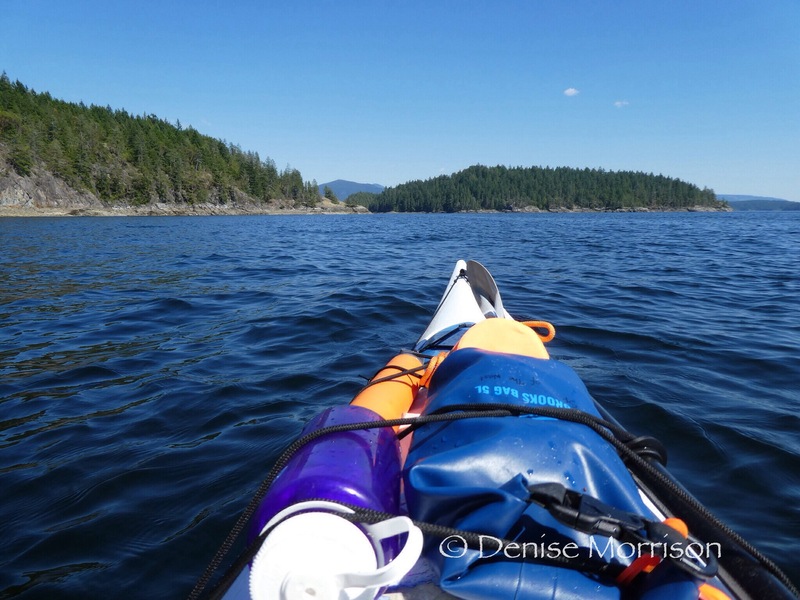 Dhamma and kayaking together? Where do I sign up? So I recently joined some friends in Canada for some kayaking and camaraderie. Ajahn Viradhammo gave several talks and wise teachings in this smaller group setting. Several “Cortesian” friends generously offered the use of their homes to our group, and we spent a relaxing week enjoying the atmosphere. The surrounding scenery was truly awe-inspiring, and led to a quiet stillness. 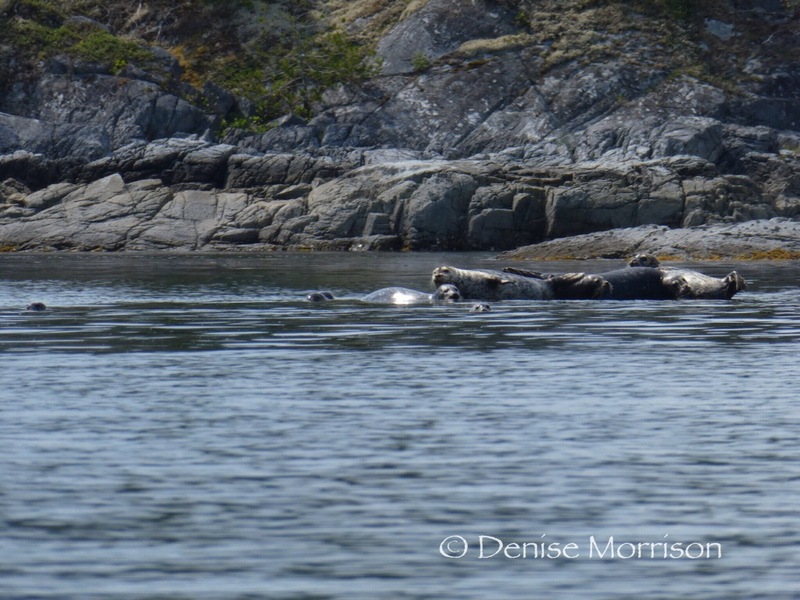 Following this, we went on a kayaking trip on Desolation Sound, east of Cortes. 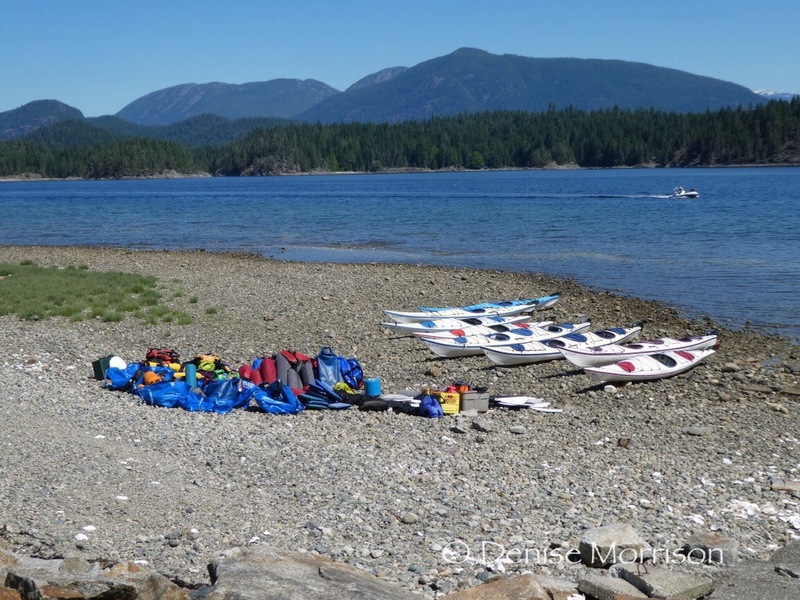 We loaded a mountain of gear into a mix of double and single sea kayaks, and set course for across the sound to the Martin islands. All of this gear did eventually fit inside these kayaks. With room for ten people as well! Landscapes that looked so far away from the shore of Cortes soon became more familiar. 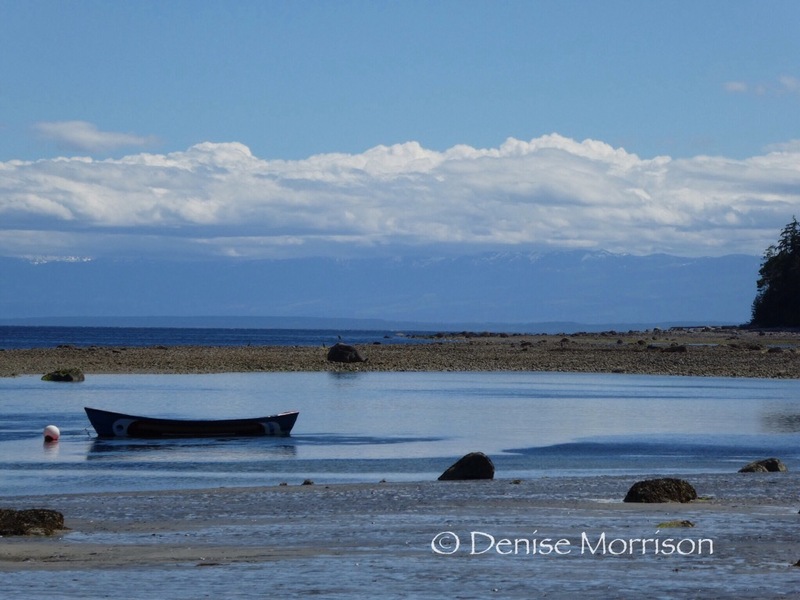 We set up our base camp, and over the next few days explored the Curme islands and Kinghorn Island. 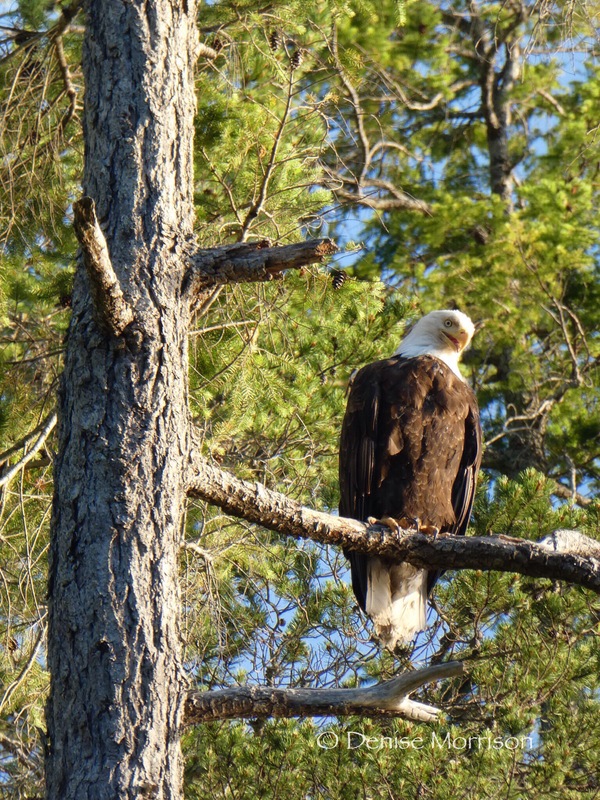 We enjoyed spotting seals, deer, and numerous eagles, and took advantage of warm enough weather and water to go for a swim on most days. The cooler water was a welcome relief for sore muscles, and was clear enough to spot starfish and other sea life below. Our return trip was a little more challenging. The sound crossing was pretty choppy with winds at 12-15 knots and waves crashing over our kayaks at times (yay for spray skirts!). Yet the kayaks felt secure, and paddling through the waves was quite fun, even if we did feel like we were still at sea for a few days after our return. During a weekend retreat in Victoria the following weekend, Ajahn Viradhammo recounted how Luang Por Sumedho would describe an event as a “peak experience “; acknowledging that something was enjoyable, yet subtly pointing to its effervescent nature without being a downer. I would definitely describe this trip as a peak experience, and am thankful to Ajahn Viradhammo, my friend Sobhana, and many others who made it possible. 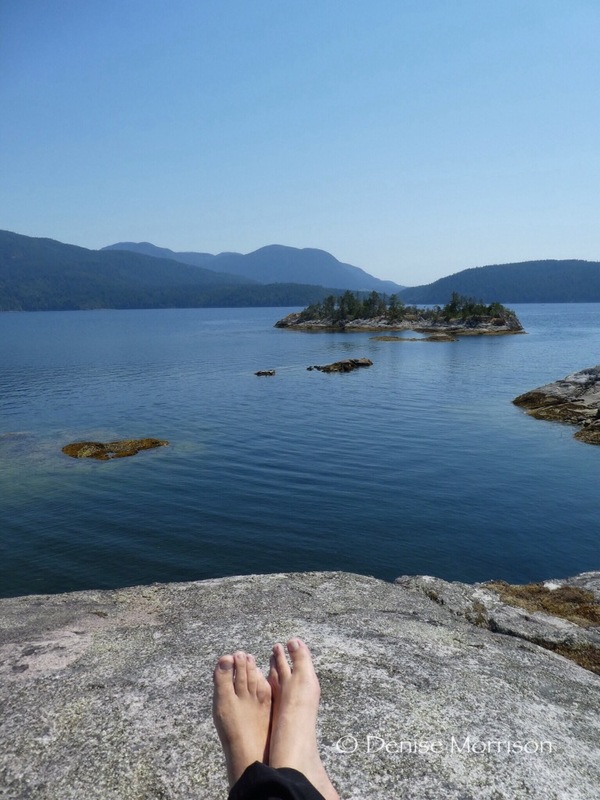 I’m heading north to Cortes Island, in British Columbia, Canada, and spent the weekend in Nanaimo. 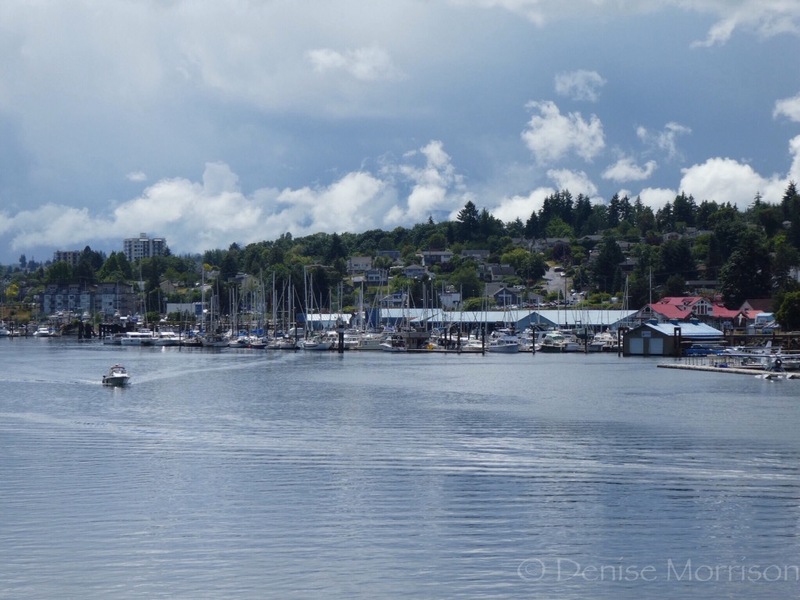 Nanaimo is a harbor town on Vancouver Island, and home to the famous Nanaimo Bar. 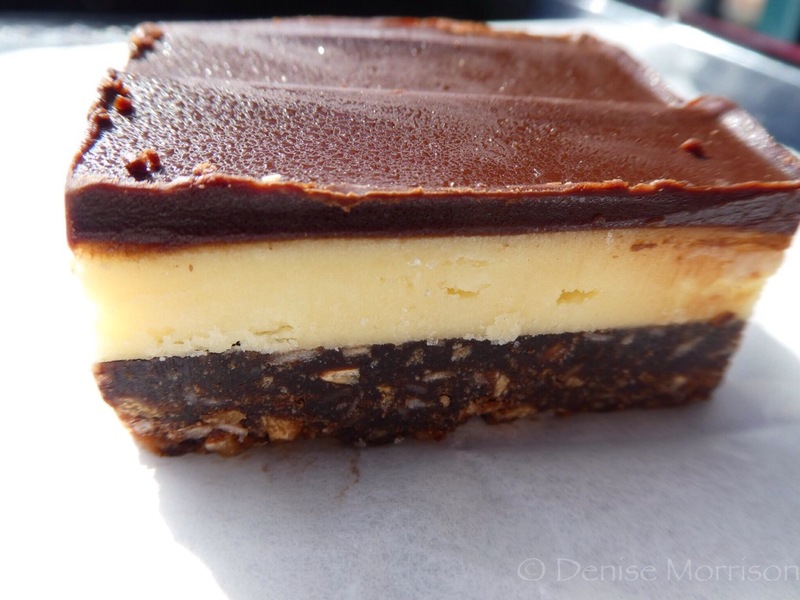 What’s a Nanaimo Bar, you ask? An amazing, three layered desert: start with a base of graham cracker crumbs, chocolate, nuts, and sometimes more, add a layer of custard frosting, then a layer of chocolate on top. Not for either the faint of heart, or those who are diabetic. 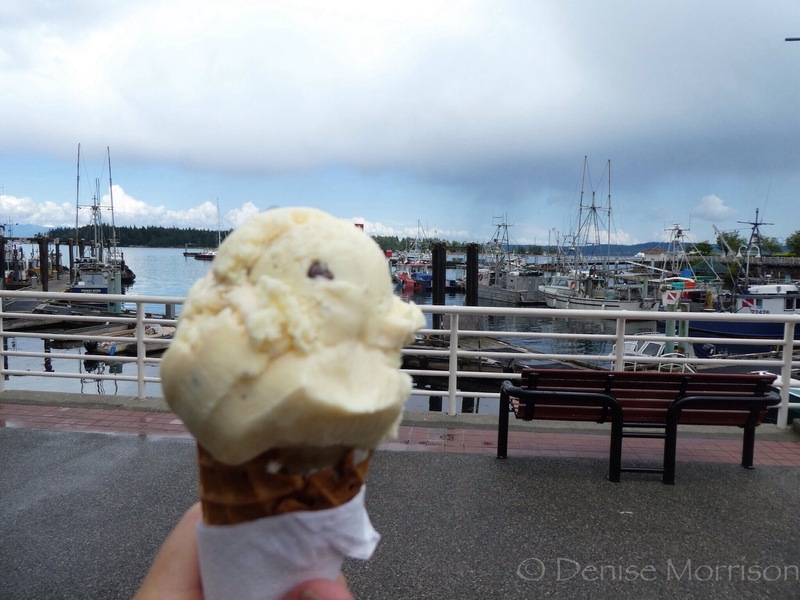 Having encountered one of these in Canada nearly ten years ago, and because the town was on the way, I decided to spend some time eating Nanaimo bars in Nanaimo. 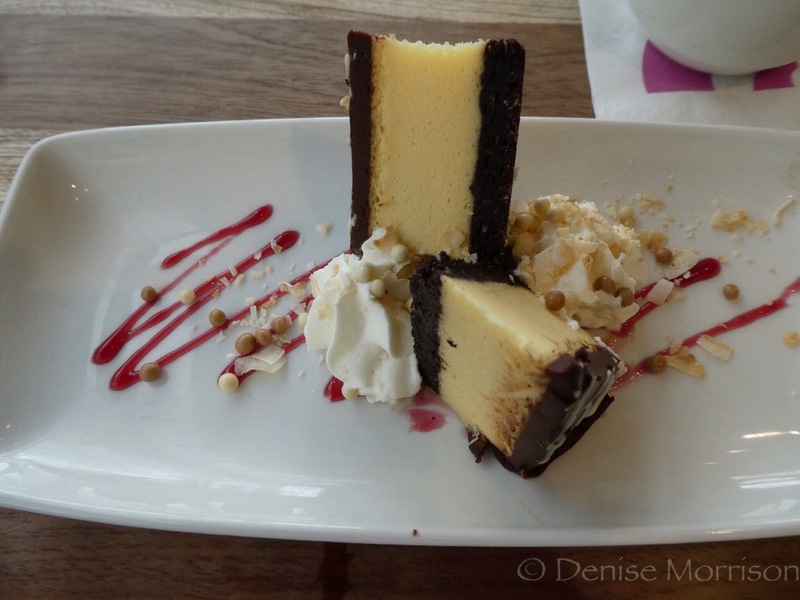 And Nanaimo bar cheesecake, ice cream, latte’s, etc. It’s not all Nanaimo bars. There’s a walkable downtown area that extends to a beautiful harbor. It’s a bit sleepy: when I arrived around 6 on a Friday evening, only a few restaurants and bars (none of the shops) were open, and the next morning only a few places were open before ten. The parks, however, were beautiful. 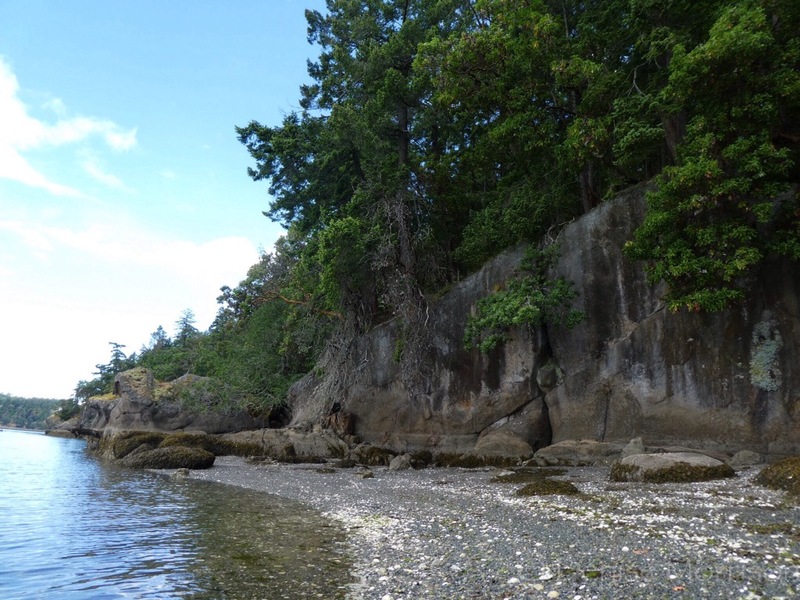 When I wasn’t consuming Nanaimo bar related items, I found myself walking through forests, either in Bowen park or Newcastle island. 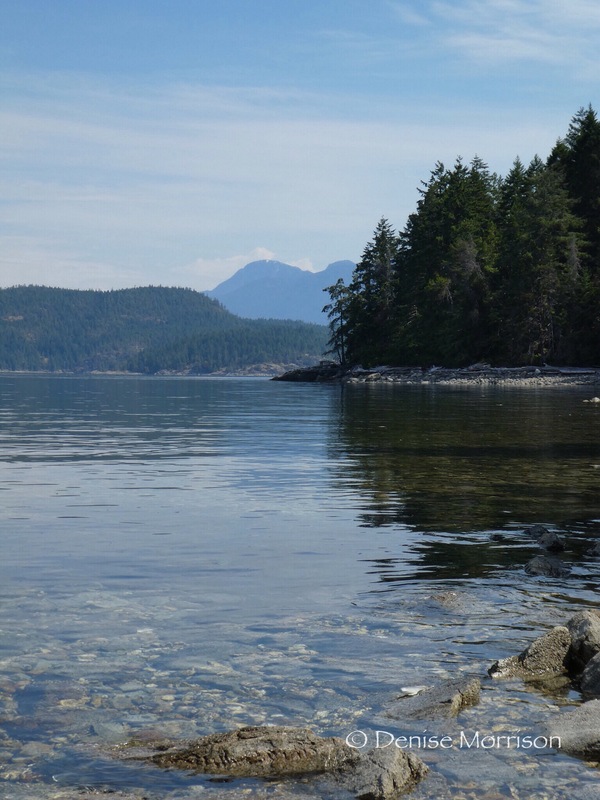 The beauty of Pacific Northwest forests, and the smells of damp, green earth, cedars in the sun, and the salty sea made for some beautiful walks. 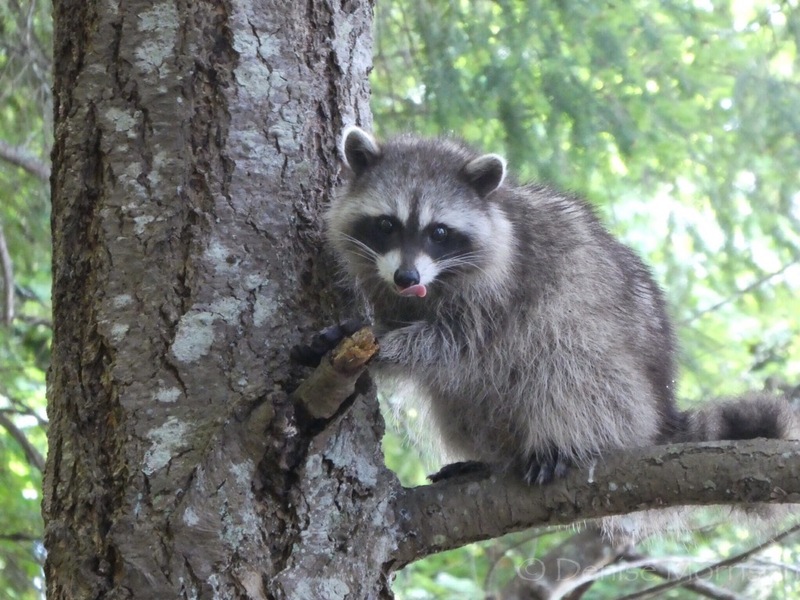 Good thing, after eating all those Nanaimo bars! When I arrived at Abhayagiri five months ago, I had a plan. I was going to stay there indefinitely, and all was going to go perfectly. As I’ve heard in the past, “If you want to make the universe laugh, just develop a plan”. As I stayed here, I was reminded that my plan was not necessarily the plan of the community. It would remain to be seen whether it would work out to have me stay. And on my end, as I learned what living in a large community entailed, there was some wavering. Was this what I really wanted? Could I fit in to this large group and lifestyle? But in time I began to feel the strength of the community, and the benefit of living and practicing within it. Once again, I felt a firm resolve to stay put. I had a plan. Despite the fact that everything around us is constantly changing, the mind clings to the idea of certainty, to safety. The habit is in our DNA, to ensure the continuity of the species. And yet, the very clinging for safety, the constant planning, the gripping to the “sure thing”, causes stress. There’s no end to it. It’s like walking up an icy hill, scrambling for purchase that isn’t there. Or, as in one of my favorite movies, The Christmas Story, like Ralphie scrambling up the slide to try to get what he wants from Santa Claus (Watch here). Ajahn Chah, the founder of the tradition which Abhayagiri follows, used to frequently say “Mae Naer” or, “Not sure”. No matter how much control we think we have over what happens, it’s not sure. Even the thoughts we have in our mind, and their validity – not sure. The validity of the contents of this blog? Not sure. Intellectually it makes sense that all is changing, and that what I think to be true may not be. Yet in actuality it’s been a more challenging practice to incorporate. I like to be in control. Who doesn’t? Yet I’m reminded over and over again that I’m not. Despite scrambling for purchase on the slide of life and occasionally reaching the top again, the foot of reality says “You’ll shoot your eye out, kid”, and I’m once again going for a ride. In my life, change has struck again. While I will be returning to Abhayagiri for a few weeks after this coming trip to Canada, I won’t be staying there as originally planned. Instead, I’ll be spending some time with my parents in Pennsylvania. I’m ok with this new plan, and it feels like the right thing to do right now. And maybe, just maybe, it’s not so much a plan, as just accepting what is, right now. Be well and peaceful dear readers, and in the words of Ajahn Sona, another teacher in this tradition…. “Don’t worry. Everything is perfectly out of control”. return for the community and the abbot, Ajahn Pasanno. etc.. I’ve been one of those volunteers for the last three months. life of a retreat support member goes something like this…. Is it really 4AM already? minute walk, which helps to add some wakefulness. day with our appointed tasks. and the skill of the cooking crew, it’s usually a pretty good meal. sometimes with free time to practice on one’s own. some reading, go to bed to do it again the next day. track of time: What’s the date? What day of the week is it? community will allow me to do so, and see where life takes me. something I had hoped two years ago that I’d be able to work on. books, but one I’ll enjoy working on. and another in August, and hope to return here between them. being here now, every day, over and over again. mettatsunami Create a free website or blog at WordPress.com.